Director Brian A. Miller is to Bruce Willis what Peter Berg is to Mark Wahlberg, the difference is that unlike the Wahlberg/Berg pairing which pumps out movies that get theatrical releases and which people actually see (regardless of quality), the Miller/Willis pairing has resulted in a couple of mediocre cop dramas that few have seen. The latest of Miller's cop movies is called Backtrace and though it doesn't star Willis, it does have another ageing action star at the helm: Sylvester Stallone. Stallone stars as Sykes, a detective on the hunt for a bank robber suffering from amnesia, played by Matthew Modine, who has been sprung out of a maximum security facility by another group of bad guys who give Modine an experimental drug in an effort to bring back his memory of where he buried $20 million dollars. The movie also stars Ryan Guzman, Colin Egglesfield and Meadow Williams. I've seen trailers for Miller's other projects and though I even have a couple of them on my watch list, I haven't gone out of my way to see them yet because they all kind of look like generic cop dramas. 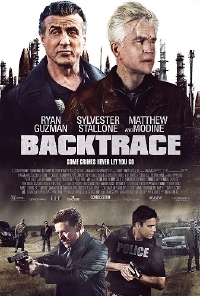 Backtrace looks no different but I like Stallone a far more than Willis so the chance I'll make the effort to see this one is much higher. Backtrace opens theatrically and will be available on VOD December 14.